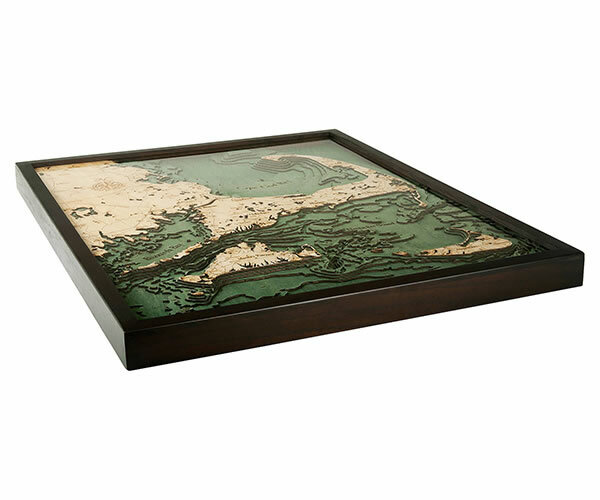 Our maps are designed by professional cartographers. Using bathymetric charts (underwater equivalent of topography) and satellite images, the cartographers study the area and determine what should be included in the map to make it most interesting. Next, they determine how many layers the map should be divided into and then research all the points of interest that should be included that will make up the added detail. Each map is highly detailed. Land features include such details as: cities, towns, state parks, major and minor thoroughfares and even symbols; water features include: depths, islands, harbors, and channels. The level of detail on our maps is impressive; much time is spent in the rendering phase. Once the details are finalized, the map is put into production in a shop dedicated solely to the manufacturing and assembly. 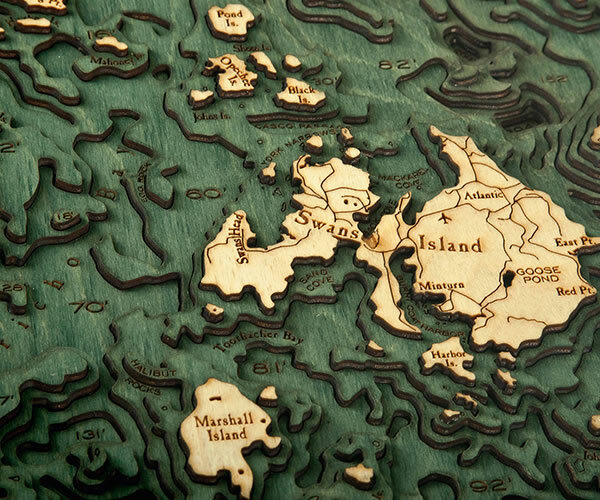 Using state-of-the-art laser cutters, the maps are cut from Baltic Birch and then laser etched with all the fine details in the rendering. The details in the rendering are determined in advance and customization is not possible. The wood is then stained a beautiful deep hue, glued and assembled by hand, and most are framed in a solid wood. (a few mini maps, like mini Lake Tahoe and mini Grand Canyon are unframed). Upon completion, the maps are ready for distribution and delivery to our customers. 6" x 12" x 1"
13" x 20" x 2"
16" x 31" x 2"
24.5" x 31" x 2"
13.5" x 31" x 2"
13.5" x 26" x 2"
The map’s orientation and size is based on the overall area depicted. 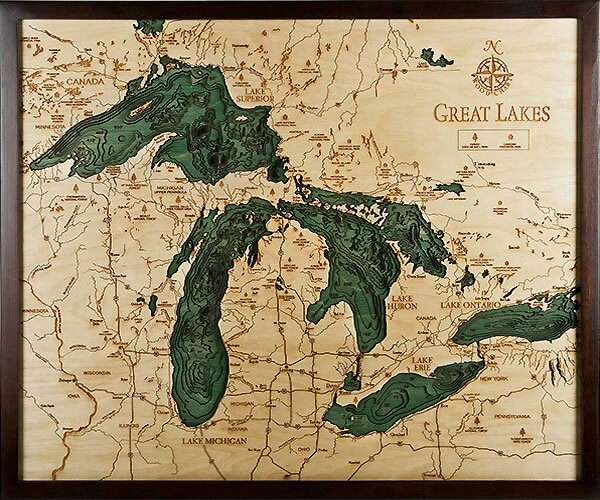 A few are offered in both larger and smaller versions: Great Lakes, Lake Michigan, Cape Cod, San Francisco/Bay Area, Lake Tahoe, Grand Traverse Bay/Leelanau, Grand Canyon, and more. The water ways of the map collection are determined by demand. New maps are released every month, and there are always new maps in the development phase. If you'd like to be contacted when new maps are released, please join our email list. Don't see your map listed? Submit a request.